A study published in 2006 reporting on emergency department (ED) visits and hospitalization due to adverse drug events found that individuals over the age of 65 were 2.4 times more likely to be admitted to the ED than younger adults.2 As you can imagine, there are numerous factors contributing to adverse drugs events, including the use of multiple medications, improper use of medications, inadequate monitoring, and drug-drug and drug-supplement interactions. Healthcare providers are often puzzled when these events occur since many are avoidable. In 2007, the American Medical Association Foundation published a manual for clinicians, Health Literacy and Patient Safety: Help Patients Understand. As implied, much of the manual’s focus is on identifying and assessing patient health literacy, which the authors believe is related to health outcomes and medication errors. The authors support these beliefs throughout the document with the evidence surrounding this concern. As they note, individuals with low health literacy have health knowledge deficits. Examples include patients with low health literacy and asthma, noting that they are less likely to know how to use an inhaler, and patients with low health literacy and diabetes, who are less likely to know symptoms of hypoglycemia compared with those who have higher health literacy. With regard to health outcomes, individuals with low health literacy are more likely to be hospitalized for any reason; have worse diabetes control, as measured by hemoglobin A1c values; and have higher annual healthcare costs than those who have better knowledge and understanding. • Provide the decision maker with all treatment options, free of provider bias, including the option of no treatment. • Include an evidence-based discussion of treatment risks and benefits. • When possible, use graphics (eg, pictographs) and quantitative information, such as frequency data (eg, one in 1,000) to explain risks and benefits. • Limit the amount of information given at each visit and repeat it. • Apply some standardized assessment, such as teach back, which involves asking the patient to repeat back instructions to ensure understanding. • Encourage patients to ask questions. In late 2011, the Agency for Healthcare Research and Quality, as part of its Effective Health Care Program, released the first of a series of patient decision aids meeting some of the attributes discussed above. 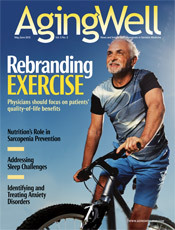 It can be viewed at www.effectivehealthcare.ahrq.gov/index.cfm/tools-and-resources/patient-decision-aids. This, in our opinion, represents a glimpse into the future of shared decision making. Although we have many obstacles to address, including time, resources, and provider and patient attitudes and expectations, we are at the forefront of a paradigm shift in communicating with patients. — H. Edward Davidson, PharmD, MPH, is a partner at Insight Therapeutics, a research and patient care consulting firm in Norfolk, Virginia, and an assistant professor of internal medicine at the Glennan Center for Geriatrics & Gerontology at Eastern Virginia Medical School. He serves as editor-in-chief of The Consultant Pharmacist, the official journal of the American Society of Consultant Pharmacists. — Lisa F. Han, MPH, is a partner at Insight Therapeutics and a contributing writer for The Consultant Pharmacist. 1. Marcum ZA, Amuan ME, Hanlon JT, et al. Prevalence of unplanned hospitalizations caused by adverse drug reactions in older veterans. J Am Geriatr Soc. 2012;60(1):34-41. 2. Budnitz DS, Pollock DA, Wiedenbach KN, Mendelsohn AB, Schroeder TJ, Annest JL. National surveillance of emergency department visits for outpatient adverse drug events. JAMA. 2006:296(15):1858-1866. 3. Makaryus AN, Friedman EA. Patients’ understanding of their treatment plans and diagnosis at discharge. Mayo Clin Proc. 2005;80(8):991-994. 4. McCarthy DM, Waite KR, Curtis LM, Engel KG, Baker DW, Wolf MS. What did the doctor say? Health literacy and recall of medical instructions. Med Care. 2012;50(4):277-282. 5. Steinman MA, Hanlon JT. Managing medications in clinically complex elders: “There’s got to be a happy medium.” JAMA. 2010;304(14):1592-1601.